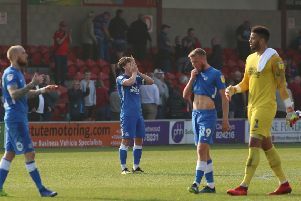 Experienced Peterborough United defender Steve Taylor insists the players are relishing the chance to impress a new manager. Taylor is expected to take his place in the Posh starting line-up for the visit of League One play-off rivals Charlton Athletic to the ABAX Stadium tomorrow (March 10). But new boss Steve Evans is adamant all first-team places are up for grabs for the rest of the season. “It’s been good to have a week with the new regime,” Taylor stated. “We have been working hard on how he wants to play. “A new manager always brings a buzz with him. Players are in his face because they want to get into his side. “I’ve seen around 15 new managers in my career and it’s always the same, but it’s important for players not to change the way they play. If you try too hard to do things differently you can make yourself look bad. It’s far better just to concentrate on what you are good at. “The change of manager hasn’t changed our ambition though. There has only been one thing on our minds all season and that’s promotion. Everything else is irrelevant. “We will continue to graft hard for each other. When we’ve done that we’ve picked up good results even against the better sides. You can’t carry anyone at this level.